Silly Elves.. you forget Broxigar. War of the Ancients was actually, to be honest, one of the best books Knaak wrote. Well, then that really says something about his horrid writing skills. Mm, true - but I suggest comparing Stormrage to WotA. To all night elves, you get to the destroy a whole troll tribe..in just two quests. Will infact be a loss to all of us and not just the Horde..no more dancing trolls when you fly over their village. Oh this just gets better and better. 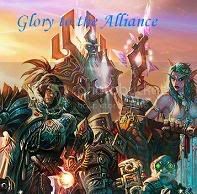 and the Alliance have the upper hand in terms of the number of bases there including entering into a partnership with the Grimtotems. Seriously, how does that come about? Anyone know of any further info about this? The Grimtotems are tauren, but...not exactly 'well liked' by the Horde (even worse in Cata...), so I'm thinking a patnership of convenience? 'Enemy of my enemy' and all that jazz?